​All meetings are held at 12 Noon at De Luca's Place in the Park, 6075 Middle Ridge Road, Lorain 44053. Contact Bernard Machovina at bmachovina@oh.rr.com if interested in attending a meeting. 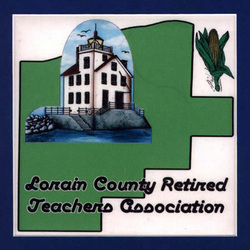 On February 13, 1948 thirteen retired teachers organized to form the Lorain County Retired Teachers Association with J. S. Mason as the first president. After that date, our history is very sketchy until 1966 when we once again surfaced with Vietta Lindsley as the president and sixty members. These members helped with contributions to provide financial assistance to teachers with below-average retirement incomes. In 1973, the organization was growing steadily, therefore, a more permanent meeting place with a large parking lot, handicap accessibility and reasonable rates was needed. Finally in 1984 the group settled on DeLuca's place in the Park in Lorain, OH. We have remained there to the present day. We meet four times each year, each time with a delicious lunch and a legislative update followed by information from candidates for local, state or federal offices, scholarship presentations, entertainment from local High Schools or local people who bring us updated information on many topics of interest to our membership. We have a picnic in the summer with entertainment, so our members can get together once for pure enjoyment. In 1973, George Thourot and Fran Cole started the newsletter LORCORTA NEWS. We have two scholarships: The Orrin Findley Scholarship, instituted in 1984 to offer scholarships to high school graduates whose family members were teachers. This scholarship is supported by the members as well as interest from the fund. In 1992,Mary Elizabeth Keller set up a trust fund, the interest of which grants scholarships to junior or senior college students studying in the field of education. During the years we have donated to many worthy causes. At the time of the 50th Anniversary of our chapter, we donated to Kinship Care to assist grandparents raising and caring for their grandchildren on a daily basis.